Fully hardy, loose-clump-forming perennial with palmate leaves, red-tinged stems and loose cymes of saucer-shaped, dark crimson flowers in summer. There are many garden varieties. To 90cm. [RHSE, Hortus]. ‘We received it [Potentilla napalensis] from our friend Mr. M’Nab, of the Edinburgh botanic Garden, who first raised it from seeds sent him by Dr. Wallich, of Calcutta. It is a hardy perennial, and thrives very well in any good garden soil.’ [LBC no.1031/1825]. The Floricultural Cabinet describes the flowers of P. formosa as rose coloured. [FC p.224, 1849]. Flore des Serres figures a variety with striped flowers under the name Potentilla striata formosissima. [FS f.695/1852]. 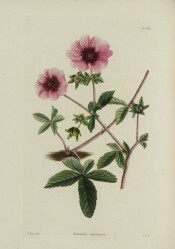 Potentilla formosa was introduced to Britain in 1822. [JD]. Saint-Hilaire pl.181/1829. Listed in the 1850 and 1857 catalogues as Potentilla Nepalense [H.192/1850] and Potentilla formosa [H.189/1850]. It is possible that these plants and others first listed in the catalogues in 1850 were obtained as seed from James Carter, Florist and Seedsman of High Holborn, with whom an order for Potentilla seed was placed on 8th of April 1846. [MP A2933-1, p.128]. The Gardeners Chronicle advertisement from which the order was taken specified eight species or varieties of Potentilla.